"A dream is a wish your heart makes/When you're fast asleep..."
Everything about our trip was magical. We happened to be there during an overcast patch of weather, which meant that we zipped through twelve attractions and also had time for the parade and several meet-the-character lines. We went with my mom and dad, and we were lucky to have cozy adjoining rooms in the hotel. Katie really loved her birthday trip, especially, and I think all of us had longings to return once the trip ended. October is so magical as it is, and this little trip right in the middle has made the month extraordinary. We are all so thankful for the memories we have made and now all share. Amie and Katie wait in line with Daddy and me for the submarine ride while Eric hangs out with Boppa. 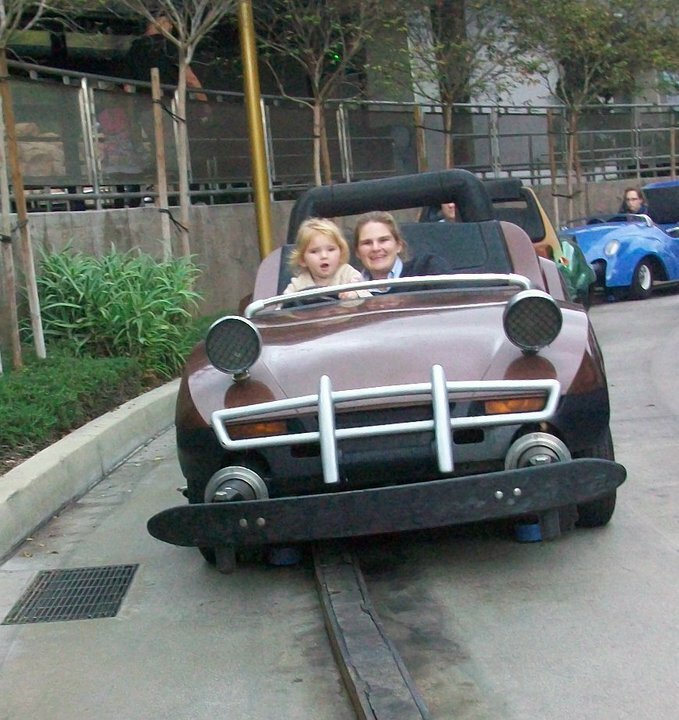 Katie had fun on the Autopia! 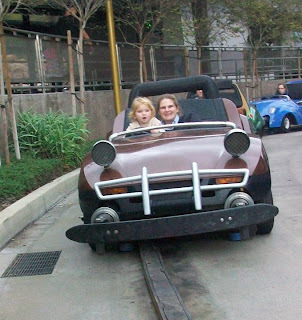 It was like Mr. Toad's Wild Ride, part II! When we checked into the hotel, we were greeted with several little magical Disney touches. 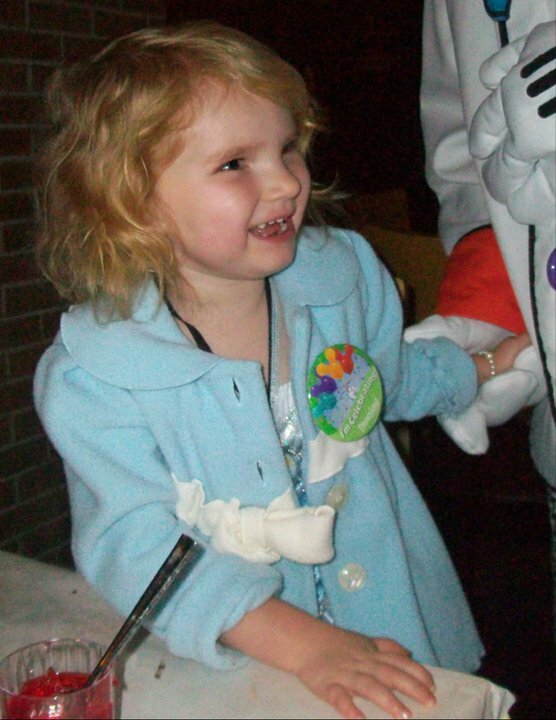 They knew it was her birthday, so they gave her balloons, a special birthday badge, and a photo card of the major princesses, signed by all of those princesses. On the day we checked out, we went over to The Grand Californian for their Storyteller's Cafe brunch with several critters. Walking to dinner at Goofy's Kitchen on the first night, we actually saw Cinderella's carriage drive by. 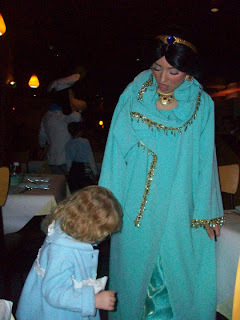 Later, we saw her glass slipper, too. Cinderella and her Fairy Godmother walked by on their way somewhere at the park, said hello, and commented on Katie's Cinderella cup in the stroller. I love how attentive the cast is to children at Disneyland. Eric looks around Fantasyland. He is such a mellow little baby to travel with. Eric Pan! Eric got a Peter Pan hat with his name stitched on to commemorate his first Disneyland adventure. Cinderella and her brother at the hotel. Goofy's Kitchen: we met Goofy, Minnie, Jasmine, Aladdin, and Pluto. Katie was enchanted. We got to dance with several of them, as well. Smiley Boy was content to look around from his stroller. 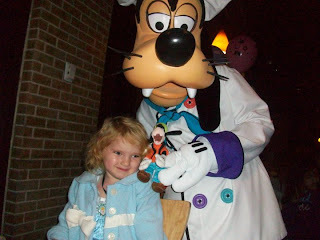 Goofy enthralled Katie during dinner on the first night. The kitchen even brought out a cupcake and sang for her birthday. I've never been to Disneyland in October since they started decorating it for Halloween. It was amazing! Here, I am in line with my latte and my baby for the Haunted Mansion. Princess Jasmine and Katie admire each other's dresses. Kisses for Winnie the Pooh! Katie got her first set of mouse ears! 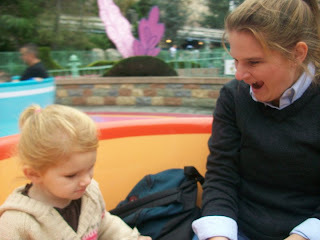 She also went on her first roller coaster, the Matterhorn. She thought it was a bit scary! Pajama party! Our headboard sparkled with light and played "A Dream is a Wish Your Heart Makes." Enchanting. Meeting Sleeping Beauty. So happy! With Amie as we are about to go on the Winnie the Pooh ride. All of us were a little sad to leave, it seemed, and I began to wonder why. 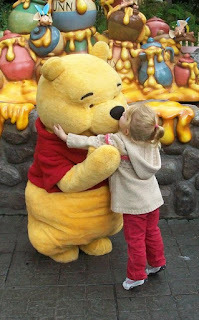 There is a tangible happiness at Disneyland, a place to be absorbed by wonder and play. What people like most about Disneyland, perhaps, is that it really is its own ideal world, and enclave mostly untouched by negativity. People are happy when they are there, and being around other happy people is contagious. Humanity seems better, the world nearly perfect. What if we could create the same kind of feeling within our own home? The beauty of Disneyland can be just as accessible from here: it is a heart-attitude, a way of looking at life. What if we could be absorbed by the wonder and simple beauty of our day-to-day lives?